The Sol Plaatje University (the University of the Northern Cape) was opened in Kimberley in 2014 with a modest initial intake of 135 students. The student complement has grown at a steady rate as courses such as the Diploma in Information Technology: Applications, a Diploma in Retail Management and a Bachelor of Education Degree for secondary school and FET teachers of mathematics, natural science and technology have attracted both local residents and those from other provinces. It is envisaged that student numbers will further increase as specialised courses in renewable energy, African languages, mining, arid-terrain agriculture, commerce heritage studies, including interconnected academic fields such as museum management, archaeology, indigenous languages, and restoration architecture are added to the university’s existing portfolio. Controlling access into the university’s facilities required that security be a driving factor, while aesthetics are simultaneously retained. Craig Sacks, MD of physical access control products manufacturer Turnstar, says that the installation of four Triton curved glass turnstiles with a powder coated finish meets all client-specified criteria. The Triton turnstiles are ideal for use in busy areas with medium security needs. Characterised by ultra quiet operation, the turnstiles blend in perfectly at the university. 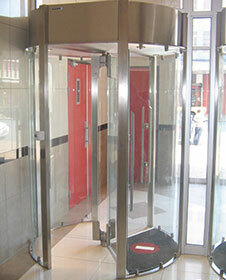 The half-height, three-arms turnstiles have bi-directional operation and have a number of security and safety features. The Anti-trap safety system means that no mid-rotation locking or trapping occurs in the event of a power failure, thereby allowing pedestrians to safely exit the turnstile without injury.